Author’s note: this article was written after the 2014 season. Since then, the Tahltan people lost a major court case; Imperial Metals completed construction of the Red Chris mine. It began operating in 2015. That battle has been lost, but there will certainly be more in the Sacred Headwaters. Learn more about the ongoing fights the local First Nations face to preserve the region here: https://www.facebook.com/klabonakeepers/. While you’re on the Imperial Metals website, it might be fun to note that the Mount Polley mine — the cause of what may have been the largest environmental disaster in North America, at least in recent years — has received the go-ahead to return to “normal operations” from the BC Ministry of Energy and Mines and Ministry of Environment. It’s not uncommon to arrive at a river and find a local paddler waiting at the takeout hoping to hitch a ride back to the put-in after a quick solo lap. But it was a little unexpected when I arrived – after driving 40 hours north from Utah – to that scene in a small First Nations community called Telegraph Creek, the takeout of the Stikine. Setting shuttle shortly after finishing the drive, I found French paddler Jules Domine hanging out at the takeout after completing one of the most significant milestones in whitewater paddling: the first solo one-day descent of the Stikine. He wasn’t sure what time he had put on and said he stopped a few times for some side-hikes. He had a much more relaxed attitude about the whole thing than I did, about to commit to my first (3-day) run down the Stikine. Ryan Lucas paddles the rapid just below Tanzilla Slot, the last major feature on the Grand Canyon of the Stikine in northern British Columbia. After more than thirty years as the “Everest of rivers,” a place where even the best paddlers in the world fear for their lives, the relationship paddlers have with the Stikine is changing. 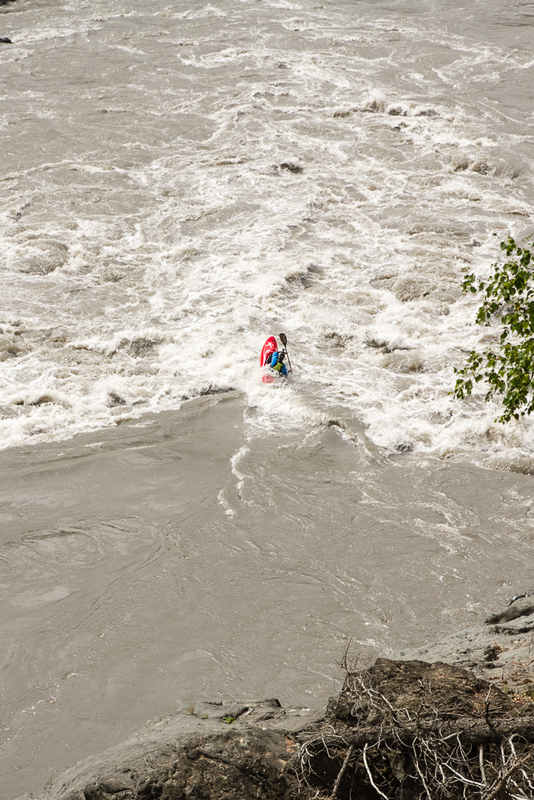 In 2012, Ben Marr ran the rapid Site Zed, becoming the first paddler to complete the entire puzzle. In 2014, that rapid was run by at least ten people, many of whom ran it more than once. Nouria Newman became the second woman ever to paddle the Stikine and the first to notch a “full descent” (no portages). There were multiple single-day runs including a handful of complete (no portage) one-day descents. Nine people put on the day I arrived at the Stikine, and three groups totaling 17 people put on the day I did. And this was mid-August – just the beginning of Stikine season, which would last well into September. I asked a couple Stikine veterans about if, how, and why paddlers’ relationship with the Stikine was changing. John Grace, who first paddled the river in 2004 and most recently in 2012, called it “a natural progression,” comparing it to how paddlers are now racing the entire Green Narrows in 4 minutes, a feat Tom Visnius would’ve scoffed after first exploring the river in 1989. By the time John first ran the river in 2004, a lot more information was available about it than ten years prior. His group had seen some video footage and had some hand-written notes from Willie Kern to guide them down the river. He told me, “That collection of knowledge made a huge difference in how we paddled the river. We knew what to look for, where the eddies were, sequence of rapids, scouting locations so on and so forth.” John’s group in 2004, and most of the groups in the early-to-mid 2000s, had the benefit of information from the previous twenty years of exploration and that made the river tremendously more accessible. That trend has continued and accelerated dramatically over the last couple years. Substantial Media House has released multiple videos showcasing the Stikine’s rapids and the Serrasolses brothers released a labeled rapid-by-rapid GoPro video of the entire river – something Doug Ammons, a strong advocate of “withholding beta” about the Stikine, is almost certainly cringing about. The amount of information available has made tackling the river a much easier task. This year, my group – myself, Rafa Ortiz, and Isaac Levinson – were able to paddle the entire “first day” in less than two and a half hours despite none of us ever having been down the river before. We’d all seen videos and spoken to friends and were able to route rapids blind that otherwise – had we not known where we were relative to the named rapids – would’ve required scouting. Todd Wells first paddled the Stikine in 2010 and has been back numerous times since. He described his first trip as life-changing – it was also his first-ever self-support kayak trip, an indicator that even in 2010, things were changing. Todd said that trip taught him “that beyond [being] just an avenue to push myself physically, whitewater kayaking can be utilized as a unique avenue to discover some of the most remarkable and unknown places on our planet.” I think this is the most magical piece about the Stikine, and something that we can work to ensure never changes. Todd said, “Each year, [the Stikine] is evolving more into another classic class V overnighter” – it may well be losing its status as the Everest of rivers, but as long as it remains wild, it will remain one of the most spectacular river trips in the world. I asked Todd and John both about the impact the increased number of paddlers will have on the Stikine over the coming years, and vice versa – about the impact the increased number of paddlers running the Stikine will have on the paddling community. John summed up his opinion saying, “I think the world would be a better place if everyone paddled the Stikine,” and pointing out that, “the more paddlers, hikers, fisherman, hunters and others who cherish wild places that go up there the longer it will take for [resource extraction] to destroy the place.” The Stikine and the greater Sacred Headwaters region has survived a few onslaughts – including an attempt to dam the Grand Canyon at Site Zed – but the region is so remote and unpopulated that very few people are aware of the need to protect it. In that regard, John is right – the more people who see the Sacred Headwaters region, the better. Unfortunately, simply visiting isn’t enough. For paddlers to have a positive effect on the region, we need to take responsibility for this area that is only accessible to kayakers. There are two parts to this. First, as some of the only people able to access this remote gorge, it’s very important that we do our best to keep it clean and wild, both for the sake of preserving it and to protect the reputation of kayakers. While portaging Site Zed this year, I came across a pile of human waste, a climbing harness, and a Mountain House meal. Both camp sites had trash left behind. That isn’t OK, and with increasing numbers of paddlers visiting the area it’s becoming more important that we do our best to follow standard leave no trace guidelines. Todd told me that on recent trips, his boat has been as much as five pounds heavier at the end of the trip – filled with trash collected at the two campsites paddlers use. Second, we need – as a group – to take more interest in the struggles the region is facing. A group of local First Nations people have been fighting the construction of the Red Chris mine, a huge operation perched between the Stikine and Nass headwaters. These people have been involved in a long legal battle in Canadian courts and the least we can do as paddlers is show some interest and spread information about what’s going on in a region that no one else sees. Stopping to talk to some of the Tahltan tribe about their fight goes a long way and it’s the least we can do to support their efforts to protect this great resource. Paddlers travel to the Stikine from all over the world and are in a unique position to spread information to the greater public about the perils faced by one of the most untouched wildernesses in the world. More and more paddlers are making the journey every year, and it may no longer be the ultimate test-piece for whitewater expedition paddling that it once was, but, as Charlie Munsey once said to Doug Ammons, “It’s still the truth,” and as whitewater paddlers we’re uniquely positioned to help protect that truth for generations to come.